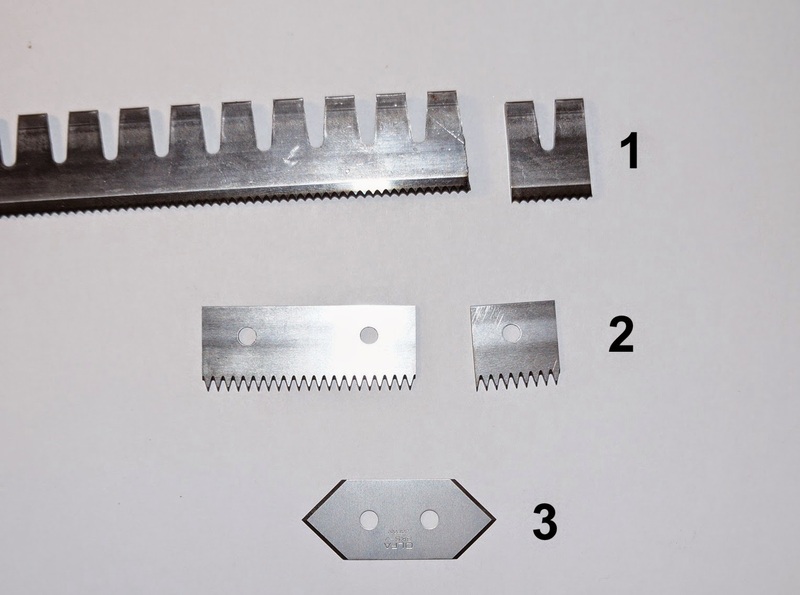 What kind of knives can you use in your Papefox TD-1 tape applicator? In the Paperfox TD-1 Tape Applicator you can use different knives. There is no "best solution", the optimal knife profile depends on the tape and the material on which you want to stick the tape. There are several manufacturer which offers rotary cutting rules. We used Böhler rules. Rotary cutting rules show a serrated cutting edge for easy penetration into the board. You have to cut the blade to insert it into the machine. 2. Martor Nr. 763 blades. The manufcturer is going to finish the manufacturing of this knife. You have to cut the blade in two to insert it into the machine. This knife is available worldwide in paper od decoration shops in 5 pcs. packets. So you can get is easily. You can mount it without any modification into the Paperfox Tape dispensers. Very sharp knife, so it cuts even the strong tapes. Because of the simly shape of the knife it don't collects the glue and dirt between teeth. The cutted ends of the tape are not sraight they are "V" shaped. If the tape is not symmetric (assimmetric finger lift tapes) it can push the tape aside. This knife is drangerous, it can couse injuries. Some customer of us was looking for a cheap creasing device so we constructed the following device. The creaser operates a creasing rule. A lot of kind of creasing rule can be mounted on the device wich are used in die cutting tools. The opposit part of the creaser is a Cito creasing channel. Could you use a simple device like this in your work? We offered the Paperfox KB-32 press until now "only" for die cutting, punching, creasing, perforating. Now we inserted an embossing tool into this device. So now you can use also for embossing this cute device. The Paperfox H-1 clinder die cutter is a cool device we have a lot of satisfied cutomers. An ethusiastic uer of this brilliant device suggested us to enhance the machine with a plastic-surface cylinder. The work with this device is not only quicker but also more confortable in this way. We don't know yet how long is the lifetime of the new cylinder but the operational experience is very promising. The Paperfox EVV-1 Edge Protector Cutter can cut only edge protectors up to 50x50x5mm. Now we have developed a prototype which can cut edge protectors up to 80x80x8mm. We hope that we can start to manufacture this device soon. We have transformed a Warrior business card slitter to a card cutter-perforator by cutting small gaps into a cutting circular knife. In this way you can manufacture a pair of cards perforated at the middle. You can use this cards for example as a coupon or voucher - or do you have better idea? This small manual die cutter is a special variant of the Paperfox MP-1 press with a special consol. So you can punch even small boxes with this device. The box can be easily placed and positioned in the device so this is a great solution for making small cuts into boxes. Here is a new rewinder for 165 cm vide rolls. 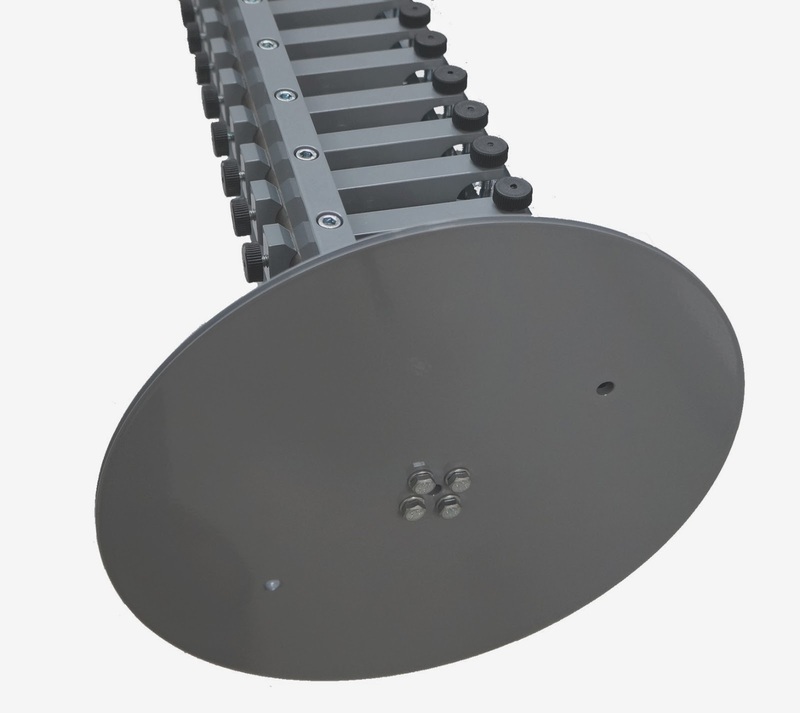 The inner diameter of the upwinding roll is 32mm. 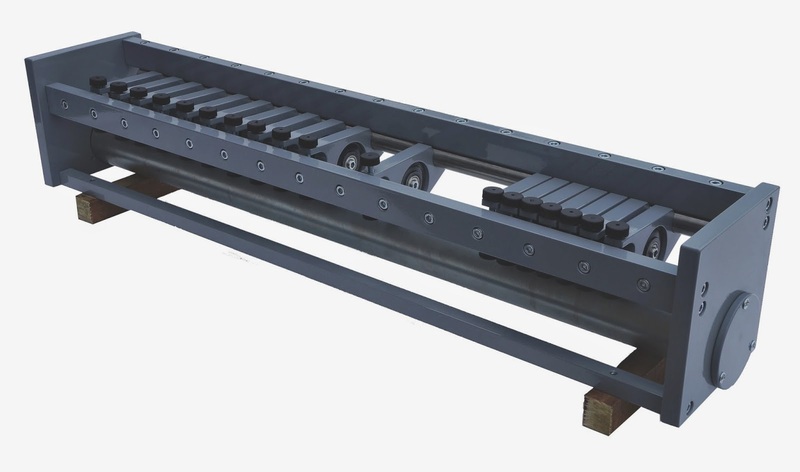 Wie have constructed a 72cm breit rollentable for two TD-1 tape applicator heads and attached a progammable controller to thedevice. Now you can position the tape independetly on booth TD-1 tape applicator heads and you can interrupt the tapa laying and start it again in a sheet. Did you know that Certified Mail forms are slightly different in different countries? We had to modify the Paperfox HH-1 return receipt making machine to be able to use lighter paper and to be able to stick double sided self adhesive strips on booth side or just on one side of the paper. So we equipped the Paperfox HH-1 return receipt making machine with an additional set of guiding rollers to ensure a straight pass through of the paper even if the machine applies adhesive tape only on one side. In addition to the normal shut off valve, we installed an other manual valve to switch off one of the TD-1 tape applicator heads if it is not needed. The other parameters of the device are didn't changed. The Paperfox HH-1 return receipt making machine can handle two rolls of 6...12mm wide "finger lift" double sided selfe adhesive rolls. The inner core diameter is 76mm the maximal external diameter of the rolls is 300mm. The Paperfox HH-1 return receipt making machine has a counter to count the sheets processed. 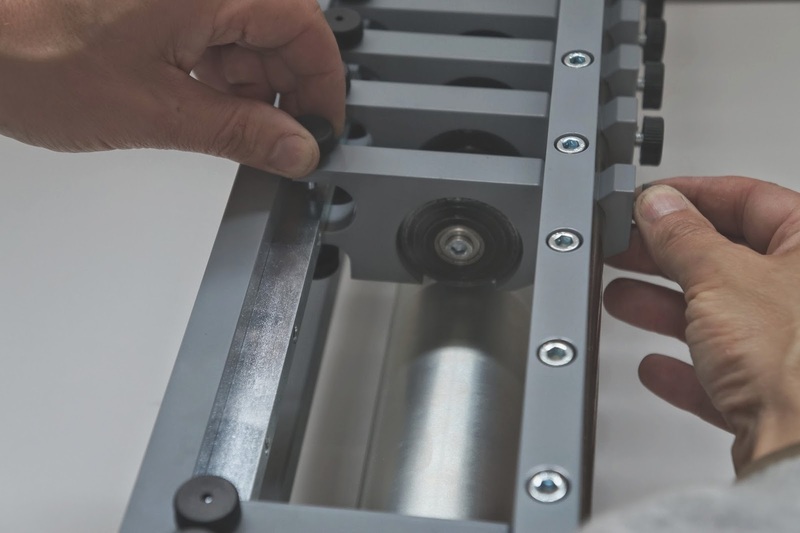 you can set the position of the tape application roughly with the position of the optosensor, and finely vith the manual pneumatic valves on the pneumatic cylinders. The upper valve sets the start position of the tape lying (if you close the upper valve then the distance of the tape start position increases from the sheet edge) the lower valve sets the end position ((if you close the lower valve then the end position getting closer to the back side of the paper). There is no English operational manual at this moment about this device, but you can find more information in the TD-1 tape applicator operational manual. You can change the creasing tool in the Paperfox KB-32 Punching, creasing machine to a die cutting tool. In this case the positioning guide of the KB-32 alone can't position the sheet well. Here is a simple solution without much extra costs for this problem. 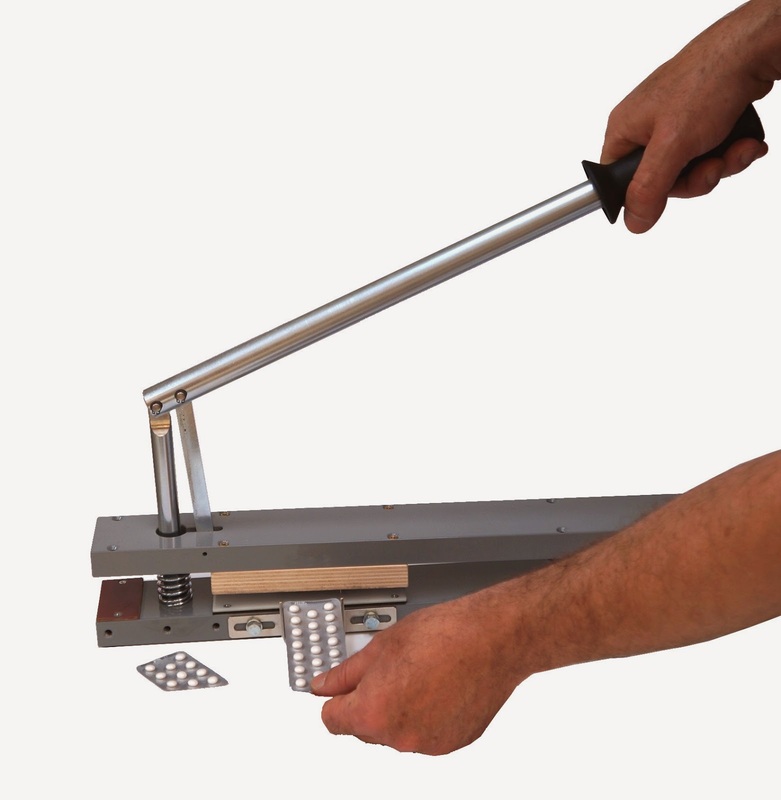 Use a simple office document clips to position the material to punch in the Paperfox KB-32 Punching, creasing machine. 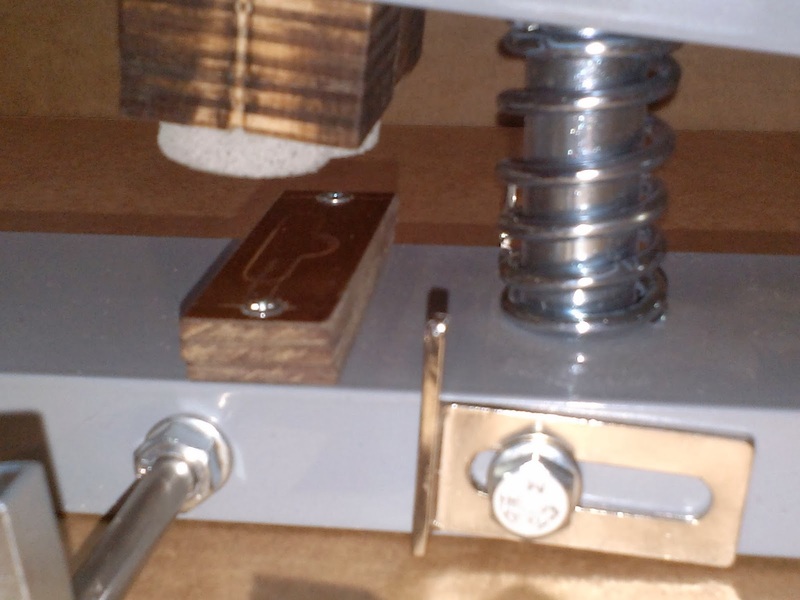 Why did we manufacture a double head Grommet Fastener Set? - With self-piercing grommets: The self-piercing grommets can't cut its own hole in all materials. - With combined tools: The grommet fastening tool is expensive, the punch tool should be from time-to-time changed. The combined tool even more expensive and it should be often changed or resharpened. 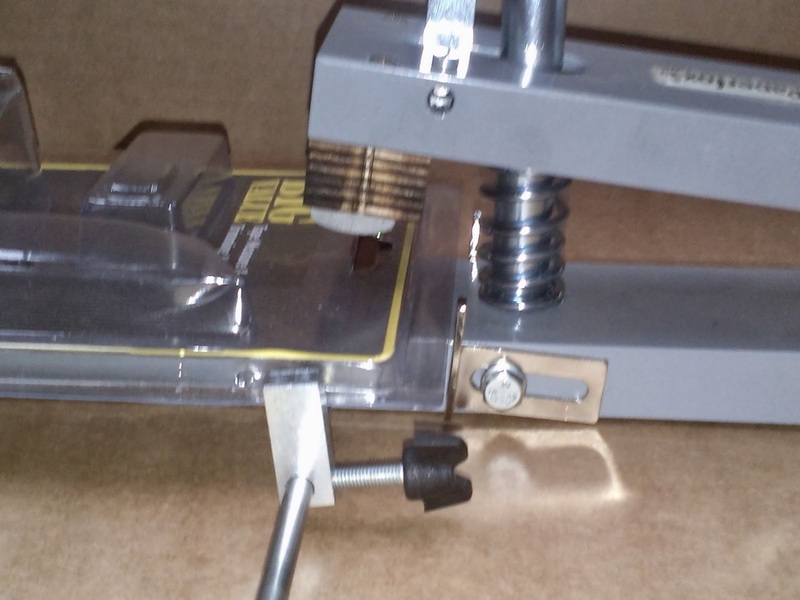 - With our double head Grommet Fastener Set: The grommet fastener tool is durable, the punching tool is cheap so there is no much costs with keeping it sharp. 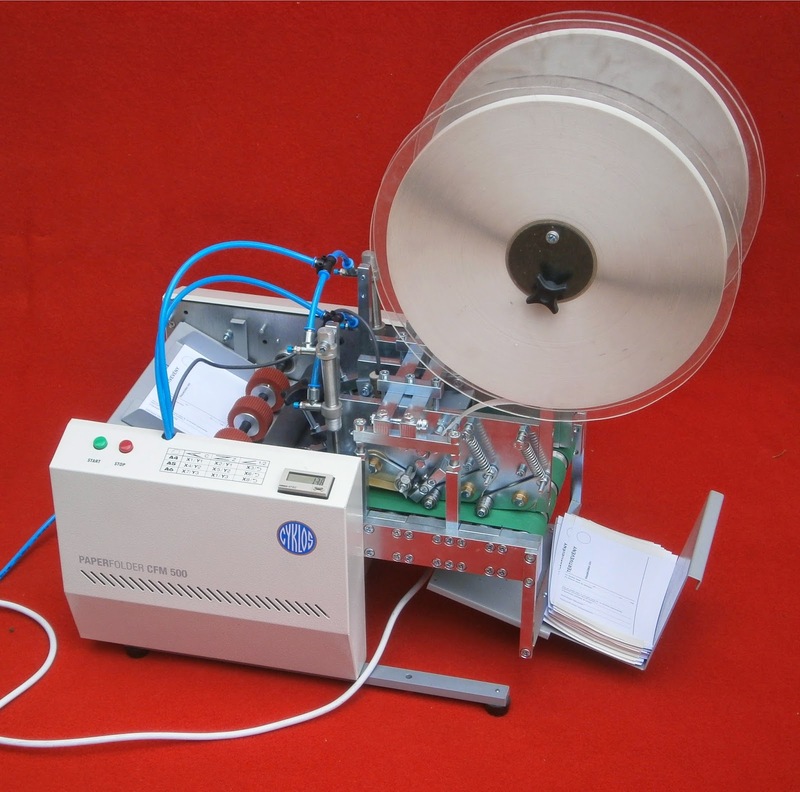 Now you can apply even two different kind of double sided self adhesive tapes in different length at once with this semiautomatic tape applicator. Blister cutter for the pharmaceutical market. Paperfox has developed a new positioning solution for the Paperfox KB-32 press to cut pharmaceutical packagings to smaller portions. We have manufactured a kisscutting head which you can insert in your roll processing machine. You can use the knives and knife holders of the Paperfox R-761 kisscutting machine in this device as well. The cylinder of the device runs free, but you can drive it with a belt pulley as well. We started to develop a curtain grommet application tool prototype, which we have mounted on the base of the Paperfox MP-2 press. Maybe that it will be a successfull product in the future? We have visited the FESPA Digital (20-23 May 2014, Munich Exhibition Centre) which was the largest focused event for Digital Wide Format Print. At this time Paperfox didn't exhibitied in this show, so we had some time to look arond in the fair. >> More information on the FESPA website. Although the Paperfox H-500A cylinder die cutter is intended for industrial usage, but this great device is perfect for the creative applications as well. So we offered a die cutter to the "Forrai" art school to test it on their open day. Paperfox exhibited at IPEX-2014 / London. This IPEX was much smaller than the last one in 2010 in Birmingham, but we have met a lot of enthusiastic visitors, so we enjoyed the show very much. Aftre the fair I've visited two small print shops in London and asked them if they visited the IPEX. The answer was: "What is IPEX?" 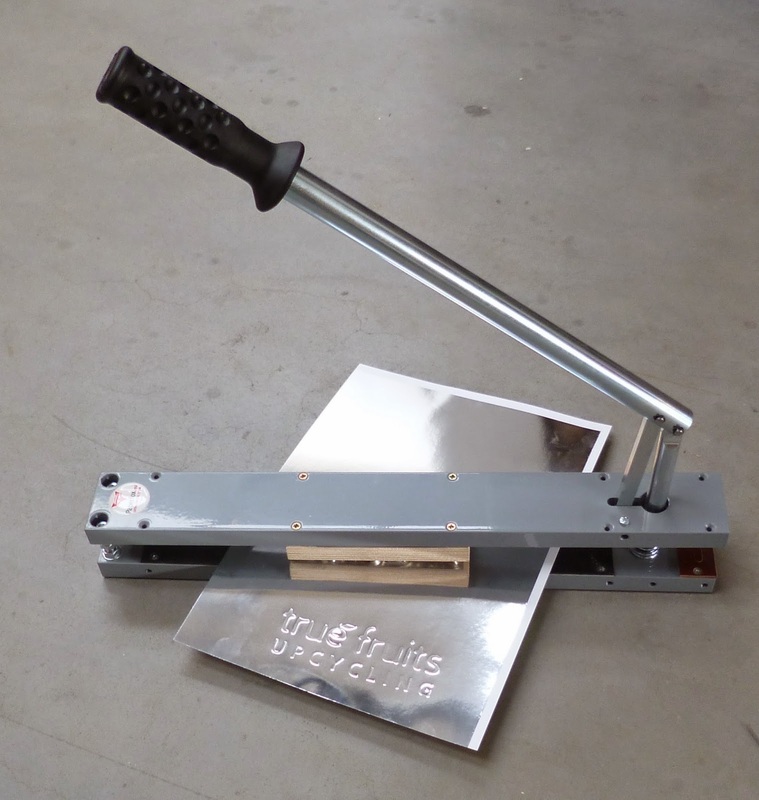 You can lay self adhesive tapes on envelopes with the Paperfox TD-1 tape applicator head and with a roller table which we have manufactured to present the usage of this device. We have made a video to show how can you set the Paperfox TD-1 tape applicating head to different tasks. Some customer of us suggested to manufacture sutch euro slot punh where the waste mateiral leaves the tool trough the hole on the lower part of the die. So we manufactured a device in the picture. We don't have electrocorrosion machine so we have ordered the die from China. The pneumatic cylinder is not too strong so you can't punch thick blister packagings, but the tool has a long life time and you can even punch polyethilene foil with this euro slot punch. Most euro slot punch machines do not open deep enough to for us to fit the blister pack into. To solve this problem we have developed a special cutting plate for the Paperfox MP-1 euro slot punch. Now you can punch even sutch blister packagings which are not flat.